Whether you're traveling from afar or are a local in need of a break from the bustling city, Palm Springs is home to a comprehensive selection of spa resorts. Idolized by classic Hollywood, this desert oasis is two hours east of Los Angeles, and it offers up a dry climate and healing waters that have been attracting tourists to southern California since the nineteenth century. With so many spa resort options to choose from, you can easily tailor your vacation to your personal needs and recreational tastes. This selection of Palm Springs resorts are sure to please the entire family and have the most all-around selection of amenities. The Hyatt Regency Indian Wells Resort & Spa is perfect for families. 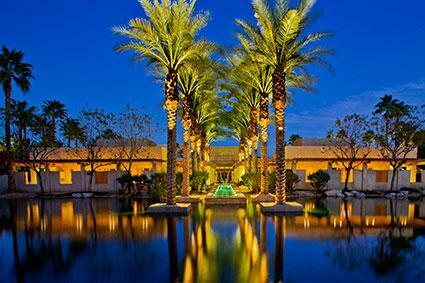 It is situated on the Indian Wells golf course and is the home of the acclaimed Agua Serena Spa & Salon. Family-friendly amenities include seven swimming pools, a water slide, Camp Hyatt sitters, and the use of private barbecue space when you all reconvene after a day full of activities. There are also adults-only areas for guests who need a brief respite from the little ones. Recommendations: The Hyatt Regency Indian Wells Resort & Spa is a consistently excellent resort that has received numerous awards. For example, it earned a 2014 TripAdvisor Certificate of Excellence, has been a AAA Four Diamond Award winning hotel since 1987 and is reviewed positively on Golf Channel.com. Its restaurant Lantana won the 2014 OpenTable Diners' Choice Award. Pricing: Rooms range from a standard room with a king bed or two queens in the $230 range to multi-room villas that are available starting in the $730 range. Ace Hotel & Swim Club is a recently refurbished retro hotel nestled among some of Palm Springs' favorite diners, and it's famous for its poolside snow cones (of the spiked and virgin varieties). Reasonably priced and well maintained, this family-friendly resort embodies the retro glamor of Palm Springs while still pleasing modern tastes. Recommendations: Both The Travel Channel and Fodors recommend the Ace Hotel & Swim Club as one of the top weekend getaway spots in Palm Springs. Pricing: Rates range from $160 for a room with a patio and garden to the $300 range for full suites. 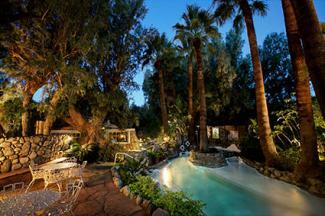 The Palm Canyon Resort is the ultimate Palm Springs escape. Centered around a 1.5 acre landscape of pools, slides, grottos, sun decks, private cabanas, and tropical landscaping, the Palm Canyon Resort rents mini-luxury villas complete with full kitchen facilities. At Palm Canyon, you can have the ultimate Zen home-away-from-home experience, relaxing or participating in and sending the kids off to its bevy of organized activities. Recommendations: The Palm Canyon Resort's former visitors particularly recommended the resort on Hotels.com, Orbitz, Yelp, and Expedia as being an excellent, family-friendly resort that lets parents get a bit of peace and quiet. Pricing: Discounted room deals go as low as the $160 range, but the resort's multi-room villas wander into the $300 per night range. Channeling the Spanish Revival and Craftsman style of 1930s California, the 25-room Andreas Hotel & Spa is a landmark resort located in the heart of downtown Palm Springs. Originally built in 1935, the hotel's renovations in 2004 modernized the property yet still retained its elegant retro charm. Recommendations: The Andreas Hotel & Spa has received a TripAdvisor Certificate of Excellence for 2014 and all noted preceding years. It was named the best relaxation spa hotel in the entire United States by TripAdvisor in 2010. Pricing: Rooms at the Andreas Hotel & Spa range from $110 to $370. Located within central driving distance from downtown Palm Springs and its main attractions, Riviera Palm Springs is the historical Palm Springs resort and spa of choice. It was the epicenter of Palm Springs culture in the 1950s and 1960s, and is always undergoing the latest refurbishment to stay current with the needs of its guests and technology of the time. Pricing: Deals for single rooms at the Riviera Palm Springs are available for as low as the $150 range on their website. Suites start in the $220 range. 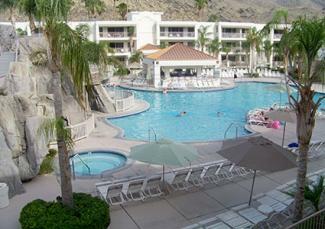 The historic La Quinta Resort & Club is located just outside Palm Springs near the small village of La Quinta. This 45-acre resort is an exclusive escape with golf courses, lush pool landscapes, and Hollywood history. Many of the greatest classic films, such as It Happened One Night, and songs, like White Christmas, were penned by its glamorous guests of a bygone era. Its recent 2014 renovations have amplified the property's Old World charm and updated the Spanish Colonial property to please solitary guests, family groups, and business conferences alike. 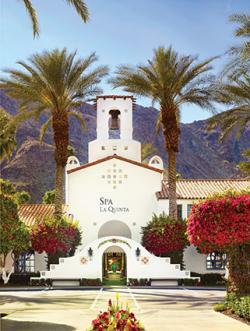 Recommendations: The La Quinta Resort & Club is a Waldorf Astoria property and is frequently listed as one of the top 50 spas in America. It is rated highly by Palm Springs Life Magazine. Additionally, Luxury Travel Magazine lists La Quinta as the top tennis resort in the world. Pricing: Rooms regularly range from around $230 to the upper $600 range, but special retreat packages offer lowered rates and combined services for the spa, restaurants, and golf courses. Sometimes what you need more than anything is a relaxing atmosphere. These spa resorts take their emphasis on tranquility to new levels, extending that atmosphere out from their in-house spas and throughout their entire resort landscapes. The Miramonte Resort & Spa, a Mediterranean villa ensconced in eleven acres of orchards and gardens centered on its own hot spring, is immediately south of Palm Springs proper. It emphasizes a philosophy of wellness and recuperation for its guests that includes spa treatments in its award-winning spa, a Mediterranean diet, and group fitness and relaxation activities. Recommendations: The Miramonte Resort & Spa has won several awards. It is a AAA Four Diamond Award resort and was labeled the World's Best Spa Resort by The Five Star Alliance. It has TripAdvisor Certificates of Excellence from 2013 and 2014. Pricing: Individual room rates run in the $230 range, with off-season deals in the $180 price range. Spa and cuisine packages can be purchased for all-inclusive rates only slightly higher than the individual rates. In the heart of downtown Palm Springs, the Palm Mountain Resort & Spa is an oasis of calm after a long day of shopping on the adjacent Palm Canyon Drive, which is Palm Springs' primary thoroughfare. Designed in southwest style, this quiet, family-friendly resort stands between the city life and the foothills of the San Jacinto Mountains where its golf course and hiking trails offer additional natural escapes beyond the peace of the resort and its spa. Recommendations: The Palm Mountain Resort & Spa was voted the 2008 Hospitality Industry of the Year by the Palm Springs Chamber of Commerce and was awarded a 2013 Certificate of Excellence from TripAdvisor. Pricing: Rooms at the Palm Mountain Resort & Spa range from about $170 to the $250, depending on the season. Its convenient location downtown means it books up fast during the high spring season, so reserve rooms in advance. Further afield from Palm Springs, the Two Bunch Palms is located in Desert Hot Springs, California. Billed as a "sacred and mystical place" for adults to rejuvenate their soul and senses, the Two Bunch Palms offers a tranquil escape and comprehensive spa centered on their mineral hot springs. Recommendations: In addition to winning the 2012 TripAdvisor Traveler's Choice Award, this spa resort also received the 2013 TripAdvisor Certificate of Excellence. Spa Magazine's Silver Sage Readers Choice Awards. The Two Bunch Palms was also written up in a 2008 edition of USA Today as One of Ten Greatest Places to Relax Your Mind and Body. Pricing: Rooms start around $270 and go up to the $500 range, depending on the room type and the season. Palm Springs' climate makes this destination a seasonal favorite with peaks in May and June, as well as early fall. However, if you're willing to brave the extreme heat of mid-summer and the decent weather of the winter, cheaper rates are possible. Just keep in mind that many of the hotels are half-staffed or closed during the mid-winter off season, so make sure the hotel you'd like to stay at will be open. Book ahead for your visit no matter when you will be going, especially during peak season.